IMPORTANT: Never untie Seven Baby™ Wrap until baby has been safely removed, to prevent any falls or injury. Seven Baby™ is not responsible for any incorrect tying and/or use of the wrap. Colors on print/web materials may vary slightly from actual fabric. WARNING: Please carefully review and follow all instructions listed in this booklet prior to use. WARNING - Failure to follow the manufacturer's instructions can result in death or serious injury. Check often to make sure baby's face is uncovered, clearly visible and away from caregiver's body at all times. Make sure baby does not curl into a position with the chin resting on or near baby's chest. This position can interfere with breathing, even when nothing is covering the nose or mouth. Never use this carrier with babies smaller than 8 lbs without seeking the advice of a healthcare professional. CARE INSTRUCTIONS: Spot clean as needed. When necessary, machine wash cold with mild detergent on delicate cycle. Never use bleach. Hang dry when possible. Leaning, bending over, or tripping can cause baby to fall. Keep one hand on baby while moving. Never untie Seven Baby™ Wrapuntil baby has been safely removed to prevent any falls or injury. Seven Baby™ is not responsible for any incorrect tying and use of the wrap. Check for ripped seams, torn straps or fabric, and damaged hardware before each use. If found, stop using carrier. Always check to ensure that all knots and straps are secure. Ensure that the baby is safely positioned in the Seven Baby™Wrap according to manufacturer's instructions for use. Never leave a baby in a Seven Baby™ Wrap that is not being worn. Never use a Seven Baby™ Wrap when balance or mobility is impaired because of exercise, drowsiness, or medical conditions. Never place more than one baby in the Seven Baby™ Wrap. Never use/wear more than one Seven Baby™ Wrapat a time. Never use Seven Baby™ Wrap while engaging in activities such as cooking and cleaning, which involve a heat source or exposure to chemicals. 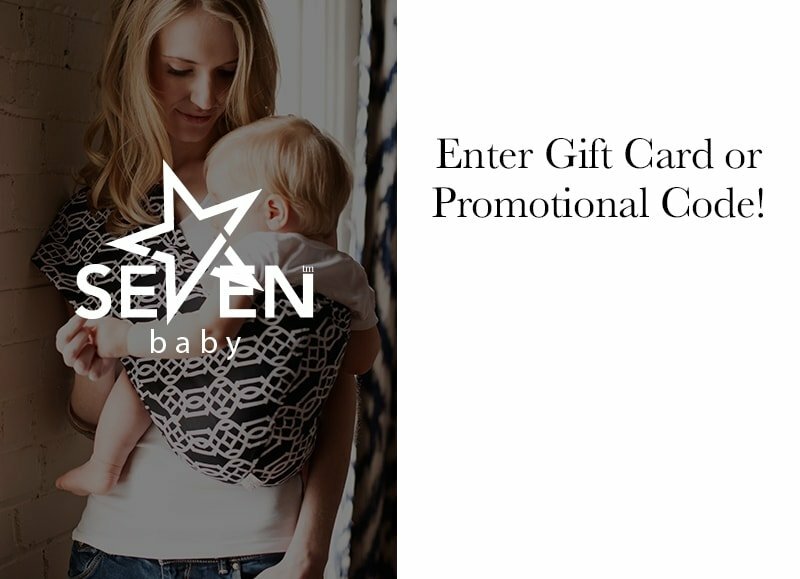 Never wear a Seven Baby™ Wrap while driving or being a passenger in a motor vehicle.